I am making a T-shirt quilt for a gentleman who really likes plaid, and has requested that the backing be plaid flannel. That's fine. I'm good with that. 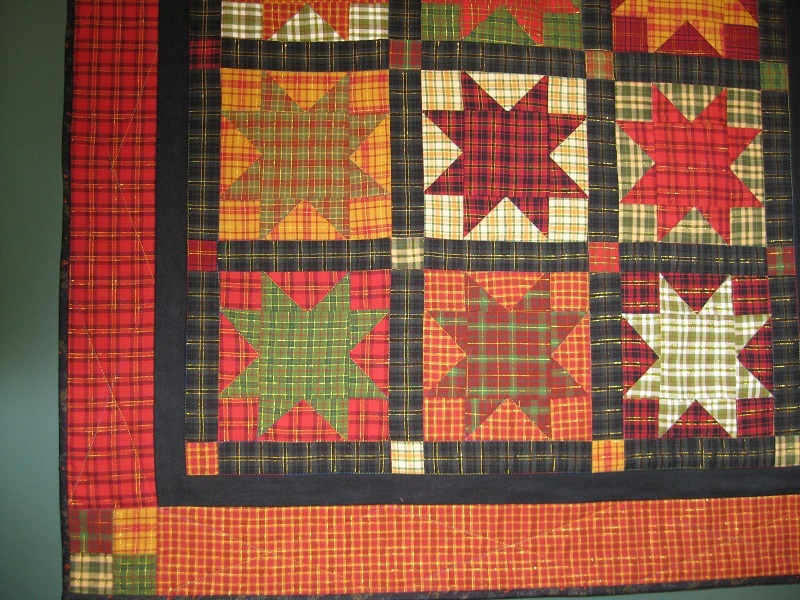 I made my husband a quilt using some of his old (beautiful) cotton shirts in the blocks, and I made cornerstones for the solid sashing out of the plaid fabrics, and also a scrappy border using several of the plaid fabrics. They actually worked the opposite of exploding head since they provided a straight cutting and sewing line....and mind you I was working from pieces of a shirt...sleeves, etc. I say go for it. I think you (and he) will love it. ​You could try the plaid sashing but break up the sashing with cornerstones. Check to see if the plaid is printed straight before trying. Sometimes the plaid is printed crooked and no amount of cutting will allow the lines to look straight. Solid sashing and the plaid on the bias for binding would look good also. If you have an asymmetrical plaid, you will need to be very careful in cutting and sewing the sashing, since you can't "interchange" horizontal sashing strips and vertical sashing strips. In short, yes you can, but it will take more time and more fabric (needed to match the plaids). I vote for a bias plaid binding. I like this, although I might toss in some plaid cornerstones. Thanks for the hugs!! Good advice on the possible problems with printed patterns (like my alliteration?!) - I think woven is the way to go. And you've registered another vote for solid sashing with cornerstones...a pattern is developing here. Thanks you for that link! That was very helpful, and solidified several vague feelings I had had about plaids and their wily ways but had never really thought about. Excellent! Plaids (or stripes) are really simple to use as they have a built in straight line. That said, you do need to determine the repeat of the plaid if you are wanting uniformity. And a squiggly plaid or stripe can make you fear you're going nuts! If you use the plaid as sashing you will probably want to use solid cornerstones. Or vice versa. I used plaid sashing on a quilt a few years ago and thankfully, it was very straight. But, I did cut it out using only one layer at a time so that there wasn't any distortion. You could buy a plaid that is printed on the bias. It would lend visual interest and you wouldn't have to worry so much about keeping lines straight. I just wanted to pass a tip along - one of my favorite ways of adding sashing to a quilt is to sew strips of sashing around each side of every block. When you assemble the rows into a top, all you have to do is make sure you match the seams. I find this much easier than sewing on long strips of sashing, then trying to make sure all the blocks line up exactly even. I used plaid in a double wedding ring quilt. I was lucky as the arc shape pieces are not cut on the straight so this was not a problem surely if the back is plaid fine. You could use solids and make a plaid design. One of my first pieces was a plaid star with plaid sashing. The gold threads of the plaid were obvious and I was concerned about it looking wonky. I "fussy cut" the strips so that the obvious plaid was in the center and not near the edges. Then I used cornerstones - this is the result. Are you talking about tartan when you say plaid? A plaid is a blanket-type piece of clothing worn over the shoulder. Tartan will be woven, so should largely be straight. Checked fabric could just be printed, so may not be. I bow to the specific and regional knowledge of a Scot! Are all tartan patterns associated with a particular clan? Or are there some that are just generic? Thank you for asking! Originally all tartans would have been associated with a clan, but over the years they've changed and some modern, generic ones have crept in such as 'Flower of Scotland', 'Pride of Scotland' (bit of a theme, lol). It's believed that Clan tartan as we know it was actually a 'fashion' item devised by two English brothers! Dress Stewart (red) is the one you see the most worldwide and is the official tartan of the Queen - it can therefore be worn by any of her subjects. Jumping down from pulpit now. I do not disagree with you, but if you walk into a fabric store in the US and ask where the tartan fabrics are, you will get some weird looks and will end up having to use the word "plaid". My husband's family is Scottish, and when I tracked down the family tartan and showed it to him, I think he was a little disappointed. The colors are forest green and deep fuchsia, or "pink" as he calls it. Lol! Ahhh, yes, that old saying "divided by a common language" comes to mind. Here in the US, it's all plaid whether it's woven or printed. If it's woven it's often referred to as homespun. I have used plaid as an outer border...many times...I love how it looks. But, I have never used plaid as a sashing. I think if you really want to do it, probably should use a smaller plaid. The larger plaid, the more it will show if it is off grain. If you do it, please share a picture! Does he have some old plaid shirts? OR if you can find a few at a cheap rummage sale. You'd be surprised how much fabric is in one shirt. To avoid the matching problem, you might sash each tshirt square in strips from ONE shirt and then another shirt for the next one. Use a later t shirt block with more of the same. Use at least 5 shirts. If you use the plaid form one shirt on one t-shirt block, you'd not have to deal so much with keeping plaids in order. If you bind with a plaid, cut it on the bias. It will give visual interest and save you a LOT of stress. Here in the US, it's all plaid whether it's woven or printed. Sewing with plaids and getting them on-grain is one thing. Actually matching the plaids is another. Some people don't even notice unmatched plaids, and some see them as free spirited. I personally feel like the world is off kilter when I see an unmatched plaid. Whatever you choose in the use of plaids, I would recommend planning ahead with them. I have only worked with plaids twice ... once was a rag quilt so that was fine, the other one was a wallhanging and it made me nuts trying to keep plaids straight. Result, I don't work with plaids anymore. Lol! Probably want to stay on your side of the pond now!